*I often Grammar Girl podcasts with my students so when I had the opportunity the review the book, I was elated! I know that this book will come in handy, especially in my classroom. Thanks to Jason at Henry Holt for providing me with a copy. Goodreads says, "Are you stumped by split infinitives? Terrified of using “who” when a “whom” is called for? Do you avoid the words “lay” and “lie” altogether? Grammar Girl is here to help! Mignon Fogarty, a.k.a. Grammar Girl, is determined to wipe out bad grammar—but she’s also determined to make the process as painless as possible. One year ago, she created a weekly podcast to tackle some of the most common mistakes people make while communicating. The podcasts have now been downloaded more than seven million times, and Mignon has dispensed grammar tips on Oprah and appeared on the pages of The New York Times, The Wall Street Journal, and USA Today. Written with the wit, warmth, and accessability that the podcasts are known for, Grammar Girl’s Quick and Dirty Tips for Better Writing covers the grammar rules and word-choice guidelines that can confound even the best writers. From “between vs. among” and “although vs. while” to comma splices and misplaced modifiers, Mignon offers memory tricks and clear explanations that will help readers recall and apply those troublesome grammar rules. Chock-full of tips on style, business writing, and effective e-mailing, Grammar Girl’s print debut deserves a spot on every communicator’s desk." *A grammar tip a day? Sounds perfect for my classroom. I can't wait to list a tip a day on my board and share it with my class. Thanks again to Jason at Henry Holt for providing me with a copy. I can't wait to check it out! Goodreads says, " From the New York Times bestselling author of Grammar Girl's Quick and Dirty Tips for Better Writing come 365 kicky tips and tricks for improving your writing. Millions of fans around the globe punctuate properly and communicate clearly thanks to Mignon Fogarty's practical and easy-to-remember advice about writing style and word usage. Her first book, Grammar Girl's Quick and Dirty Tips for Better Writing, hit the New York Times bestseller list, and her weekly grammar podcast has been downloaded more than 20 million times and hailed by USA Today as "authoritative but warm". Now, in tip-of-the-day form, Grammar Girl serves up 365 lessons on language that are sure to inspire. 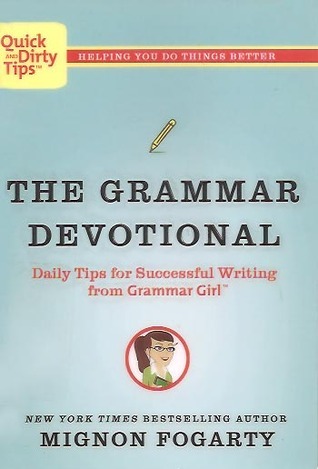 Filled with new, bite-size writing tips, quizzes, puzzles, and efficient memory tricks, The Grammar Devotional gives you a daily dose of knowledge to improve your writing and also serves as a lasting reference you'll use for years to come." *I adore historical fiction and I came across this one; I knew I just had to buy it. I haven't read much adult historical fiction lately and I plan to before the summer is over! Goodreads says, "In this groundbreaking novel, award-winning author Sandra Worth vibrantly brings to life the peoples Queen, Elizabeth the Good. Seventeen-year-old Elizabeth of York trusts that her beloved fathers dying wish has left England in the hands of a just and deserving ruler. But upon the rise of Richard of Gloucester, Elizabeths family experiences one devastation after another: her late father is exposed as a bigamist, she and her siblings are branded bastards, and her brothers are taken into the new kings custody, then reportedly killed. But one fateful night leads Elizabeth to question her prejudices. Through the eyes of Richards ailing queen she sees a man worthy of respect and undying adoration. His dedication to his people inspires a forbidden love and ultimately gives her the courage to accept her destiny, marry Henry Tudor, and become Queen. While her soul may secretly belong to another, her heart belongs to England." *I love Weir's writing style; it's so captivating. I am intrigued by the War of the Roses, so I knew I had to read this one. Goodreads says, "Lancaster and York. For much of the 15th century, these two families were locked in battle for control of the British throne. The war between the Houses of Lancaster and York profoundly altered the course of the monarchy. In this book, one of the foremost authorities on the British royal family brilliantly brings to life the war itself and the historic figures who fought it on the great stage of England." The King's Daughter sounds really good. I look forward to hearing what you think of it. I love Alison Weir's writing too. I haven't read this one yet. I usually stick to her books about the Tudor monarchs. I hope you enjoy your books. Great books! I'll have to pass along the ones about grammar to the English teachers I work with. One of them is a real grammar junkie. My mailboxes are at Inside of a Dog and Ms. Martin Teaches Media. Happy reading! I'm reading the White Queen and the Red Queen now, so i'm really interested to see what you think of the King's daugher and the War of the roses!! enjoy!